Ea O Ka Aina: UN Experts to US, "Stop DAPL Now"
UN Experts to US, "Stop DAPL Now"
SUBHEAD: "The tribe was denied access to information and excluded from consultations," says UN special rapporteur. Image above: Photo of NoDAPL demonstration by John Duffy. From original article. Backing up the Standing Rock Sioux and its allies, a United Nations expert has called on the United States to stop the Dakota Access Pipeline. Echoing pipeline opponents' concerns, the statement from the UN Special Rapporteur on the rights of indigenous peoples, Victoria Tauli-Corpuz, cited the pipeline's threats to drinking water and sacred sites. She also admonished the U.S. for failing to protect protesters' rights and failing to properly consult with communities affected by the fossil fuel infrastructure. "The tribe was denied access to information and excluded from consultations at the planning stage of the project, and environmental assessments failed to disclose the presence and proximity of the Standing Rock Sioux Reservation," Tauli-Corpuz stated Thursday—just two days after Standing Rock Chairman Dave Archambault II urged the UN Human Rights Council to help the tribe stop the pipeline. 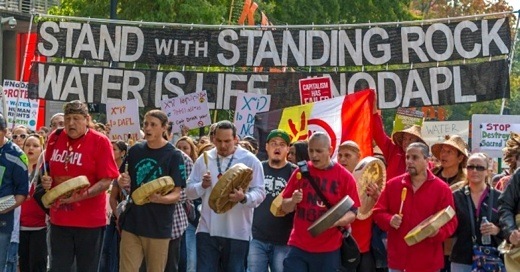 Informed consent from those affected—and abiding by the UN Declaration on the Rights of Indigenous Peoples—is essential, she said, "particularly in connection with extractive resource industries." Responding to the crackdown on pipeline protesters, she said, "The U.S. authorities should fully protect and facilitate the right to freedom of peaceful assembly of indigenous peoples, which plays a key role in empowering their ability to claim other rights." According to Tom Goldtooth, the director of the Indigenous Environmental Network, "The UN Expert got it right." "What the U.S. calls consultation is not consultation but a statement telling people what they're doing after millions of dollars have been invested, painting Indigenous Peoples as spoilers. The right of free, prior, and informed consent begins prior to the planning process, not when their bulldozers are at your doorstep." Tauli-Corpuz's statement was endorsed by seven other UN experts, including Special Rapporteur on the human right to safe drinking water and sanitation, Léo Heller; Special Rapporteur on human rights and the environment, John H. Knox; and Special Rapporteur on cultural rights, Karima Bennoune. The pipeline, slated to snake a 1,172-mile path across four states from the Bakken fields of North Dakota to a hub in Illinois, has faced months of building resistance. Given the continued protests—and legal hurdles—"the way forward won't be simple" for the pipeline company, the Bismark Tribune reports this weekend. And if it is ultimately halted, that'd be good news for pipeline opponents and proponents alike, according to Jacob Johns, a Spokane, Wash. resident and member of the An akimel O'Othm (Gile River Pima) and Hopi tribes. "We're out there protesting on behalf of the people who were for the pipeline," he said to KXLY. "They don't realize we're out there fighting for each other, we are humanity trying to heal itself and save itself." Review of "Dark Age America"
Is the Deep State dumping Hillary? Is Apple Flying Or Dying? Trump - the lesser of two evils? Keep the lights on in England? Mni Wiconi! Water is Life! We invite articles submitted by our readers. You can add an article (subject to editorial approval) by emailing the publisher with what you want to post. We will include your name as the author, or, if you are forwarding another's words, we will add you as the source.